If you manage teams or large projects, capacity planning and utilization are something you look at every day. In short, capacity planning is knowing the demand for resources and who is on the payroll in order to effectively plan who is available at any time to take on a project or task. Utilization looks at the actual work that was performed, or use of a resource in a given time period. Understanding the delta between the two is key to realizing the nuances each person or project has that can affect your capacity planning. It can help you accurately calculate the velocity of your team, see where barriers lie, where strengths gleam and whether burnout is looming. Much like digital marketing, measurement is key when managing team capacity. 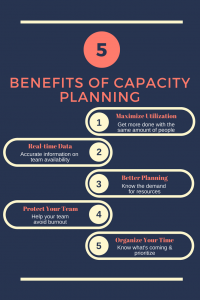 With all of the data and decision-making information that comes from capacity planning, there are 5 key benefits capacity planning has on teams, no matter the size. Maximize Utilization. Every company struggles with resource availability challenges. Having a clear view of who is available and when can help you maximize your team utilization by filling in the gaps with smaller pieces of work. By maximizing your utilization, you can get more done with the same amount of people, which increases your chances for success and on-time delivery. You Get Real-Time Data. Finding out that a key employee isn’t available until the last minute is not going to help you reach your project or organizational goals when it comes to resource planning. Ensure you have real-time data to work from with regard to personal schedules and work in the queue, and that everyone is committed to using the same system in the same way. Any tools is only as good as the data going into it. You Can Plan Better. Knowing the demand means you can plan for it – vacation time, internal projects and initiatives, new projects coming down the pike. As a team manager or business owner, being able to plan better means more accurate forecasting for your resources and projects, which means greater probability of hitting deadlines. You Can Protect Your Team. Avoiding burnout is crucial in any workplace since the likelihood of positive team morale and quality of work will suffer when the team is pushed too far over capacity for too long. Capacity planning allows you to flag potential overages before they become a larger problem. Many teams employ a project backlog for tasks once they’ve hit their threshold. If that’s not an option, hiring additional people to ease the workload may be needed. Either way, a good manager will protect the team and manage the flow of work as to not burn people out. It Helps People Organize Their Time. People are more productive when they know exactly what they should be working on. Planning out time and tasks for you team means that they know what they’ve got on their to-do list and can prioritize their workload. They don’t have to wait for an email and you don’t have to leave to chance that they know what’s important for the project. It’s a win-win. Capacity planning can take the stress out of finding people for your projects – or at least, it highlights issues so you can deal with them head-on and find solutions that keep work flowing and keep your team happy. While capacity planning might not directly influence your digital marketing strategy, we at Anvil understand the importance of having a well-oiled team on our side so that we can best serve our clients and help them reach their goals. If you need help with your digital marketing efforts in order to move the needle forward, contact us!